An alert camper on the Lower Saranac Lake caught these two swimming studs last week, apparently seeking female companionship and someone to share their dreams. 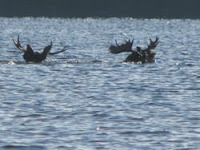 The moose(s) performance and the resulting newspaper story provides the perfect opportunity for the New York State Department of Environmental Conservation (NYSDEC) to exhort the danger of moose/car interaction. This kind of communing with wildlife is not nearly as much fun as bear/human interaction.